By Laura Allen. Storey Press, 2017. Save thousands of gallons of water annually and have a beautiful yard no matter the weather by capturing and reusing water from sinks, showers, and washing machines. This empowering and easy-to-use manual offers practical, long-term strategies for water management, with easy, do-it-yourself instructions and step-by-step photography to guide you through constructing and installing a variety of systems throughout your house and garden. No matter which system you decide to build, you’ll have the information to construct it yourself or move forward with confidence to hire a professional. Even as severe droughts become more common and the water crisis heats up worldwide, you can radically reduce water use in your own home. 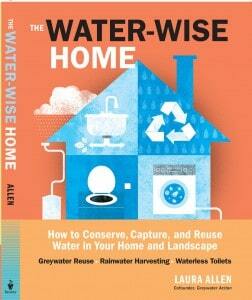 Laura Allen is your expert guide to building systems that conserve and reuse water while saving money and meeting the needs of your home and garden. These practical, low tech solutions are an essential part of our new water future. By Laura Allen. Storey Press, 2015. ‘No Water, No Life’ may sound glib to some, but it is indisputably true! Thankfully, for us lovers of watery life, Laura Allen has crafted a wonderfully accessible and detailed ‘how-to’ manual for those of us who with homes on Planet Water. This book will surely inspire and inform watery actions in the most hands-on – roll up your sleeves – let’s do this – kind of way. If every home was fully retrofitted with all of the Water-Wise project ideas presented in this book we would be well on our way to water security and watershed recovery. By Cleo Woelfle-Erskine and Apryl Uncapher. Timber Press 2012. 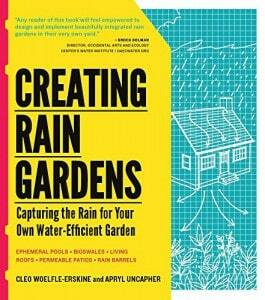 Creating Rain Gardens is a comprehensive book for the DIY-er, covering everything from rain barrels to simple living roofs, permeable patios, and other low-tech affordable ways to save water in the garden. Water conservation experts Cleo Woelfle-Erskine and Apryl Uncapher walk homeowners through the process, with step-by-step instructions for designing and building swales, French drains, rain gardens, and ephemeral ponds—the building blocks of rain-catching gardens. From soil preparation, planting, troubleshooting, and maintenance, to selecting palettes of water-loving plants that provide four-season interest and a habitat for wildlife, Creating Rain Gardens covers everything a gardener needs to create a beautiful rain garden at home. This 2007 anthology brings together an analysis of water’s history with the active fight for its future. An investigation into the political economy and environmental impact of water consumption, Dam Nation presents water harvesting and ecological as ways for readers to join the “water underground” themselves. Presenting political and horticultural strategies for transforming cities into vibrant, productive ecosystems, this anthology features stories from North American cities and an illustrated appendix of ecological design, water harvesting, gardening, and watershed restoration techniques for urban environments. by Cleo Woelfle-Erskine. Illustrated natural and social history of Oakland, California for middle-grade readers. San Francisco Graywater Design Manual for Outdoor Irrigation. Lead author Laura Allen. 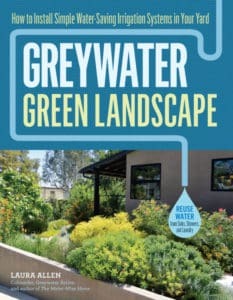 This design manual developed by the San Francisco Public Utilities Commission is a technical resource for home owners and professionals who want to install a greywater irrigation system. Residential Greywater Irrigation Systems in California: An Evaluation of Soil and Water Quality, User Satisfaction, and Installation Costs, by Laura Allen et. al. This is the largest study of real greywater systems to date in the United States. This study looked at 83 systems in California and tested soil constituents, greywater quality, plant health, user satisfaction, maintenance requirements, and installation costs. See the study webpage for key findings and download links. From Laundry to Landscape: Tap into Greywater in Mother Earth News, August/September, 2011. By Laura Allen and Cleo Woelfle-Erskine. Recycling your household water is smart and often surprisingly simple. Find out how you can embrace this “new” source of water. “Riparian Repair” in High Country News, August 25, 2008. By Cleo Woelfle-Erskine. Analysis of dam removal and restoration projects on the Clark Fork River, Montana. “St. Thomas Reemerges from the Waters of Lake Mead”, Camas, Winter 2007. “Rebuilding on Poisoned Ground”, ColorLines, Spring 2006.
by July Oskar Cole and Cleo Woelfle-Erskine. Investigation of environmental health effects of Hurricane Katrina in New Orleans. “Drying Up: The Water Privatization Pandemic” in LiP, Summer 2004.
by Kari Lydersen and Cleo Woelfle-Erskine. Survey of water privatization efforts and grassroots resistance.